Even though we humans have damaged the natural world around us, professor, author, and lifelong creation care scientist Calvin B. DeWitt shows how we can regain a joyful, positive attitude about working together for good and living in harmony with creation. Also available in eBook format. Earthwise is about living in harmony with the natural world around us—and sharing the joy of this living. Sadly, our ways of life in today's global economy have led to increasing land and habitat destruction,pollution, species extinction, buildup of ""greenhouse gases,"" and other degradations of the earth. But rather than grovel and wring our hands in despair, lifelong creation care scientist Calvin B. DeWitt suggests we discover a joyful, positive attitude about working together for good in this world. Looking forward in hope, we can make changes and take positive, lasting action that is more in harmony with the way the world works and is meant to be. 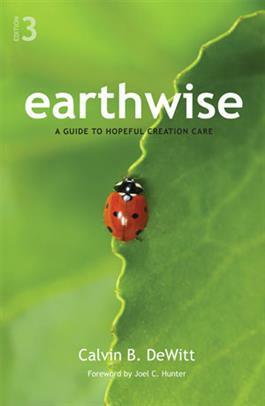 This book, now in its third edition, helps to provide us and our friends, neighbors, coworkers, and fellow citizens with practical information and ideas to become truly ""earthwise."" discussion questions that are ideal for small groups and Bible studies. a mini-workshop session on putting creation care into practice. a final chapter of inspiring stories of stewardship at the levels of state government, university research, and local town government. a self-led study called ""A Short Course in Environmental Science"" (in the Appendix). Calvin B. DeWitt is a professor in the Nelson Institute, University of Wisconsin-Madison, where he serves on the graduate faculties of Environment and Resources, Water Resources Management, Conservation Biology and Sustainable Development, and Limnology and Marine Science. His development of Au Sable Institute (www.ausable.org) brought him the Friends of the United Nations 500 award. He serves as president of the Academy of Evangelical Scientists and Ethicists, an organization dedicated to responsible stewardship of creation.